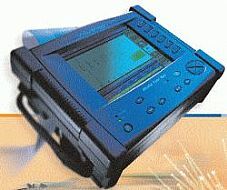 The MTS-6000 is a compact and lightweight test platform designed for the installation and maintenance of fiber networks. It offers field service technicians the highest levels of performance and upgradeability on the market. Modular in design, the MTS-6000 offers an extensive portfolio of test functionality, with over 40 different fiber modules supporting a wide range of applications, and is a single source for future fiber and photonic testing needs. Compact and lightweight for the field. Future proof with over 40 application modules already supported. Choose from IL/ORL, OTDR, PMD, CD, or WDM plug-in modules. Application modules compatible with MTS-8000. Backwards compatibility with existing MTS-5000 family OTDR modules. Simple for the novice, fully featured for the expert. PMD and spectral attenuation profile. Insertion Loss (IL) and Optical Return Loss (ORL) testing. Lightweight platform: only 2.4kg/5.3 lbs. Large 8.4 inch transreflective TFT color display improves viewing under any conditions. Extended battery life using smart Lithium ion cell. Connection checker with VFL, power meter, and Loss Test Set and video inspection scope options. Built-in optical talkset option for communicating along the fiber. Unique automatic bi-directional analysis function available to save up to 50% test time for OTDR, IL, and ORL measurements. Fast data transfer via USB, Ethernet port and 1Gb extended memory option. Comprehensive suite of PC software tools for post-processing of test results with FiberTrace (OFS-100) and FiberCable (OFS-200). Attenuation, reflectance, and dispersion are discussed. BGTV’s Kelly Hartman reviews the benefits and test functionality of the JDSU Fiber Characterization Kit. A simple, fast and compact OTDR for FTTx , PON and Access networks. Completely scalable optical test platform for optical network installation, commissioning, maintenance, and troubleshooting. 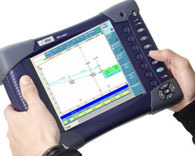 PC software for OTDR trace analysis. PC software for cable trace analysis. Wide product line of field interchangeable OTDR plug-ins, covering both multimode and singlemode networks, from very short distance to ultra long haul at any wavelength: 850,1300,1310,1383,1490,1550 and 1625 nm.